Major automakers are still reeling from the sudden realization they’ve collectively succumbed to Stockholm Syndrome, after they buddied up with President Donald Trump to alter fuel economy standards set by his predecessor. Since Trump went waaaay further than the automakers could’ve ever conceived, the industry’s lobbyists who vied for the changes in the first place are begging—goddamn pleading—with Trump to, please, pump the brakes. The standards set by then-President Barack Obama called for raising the fuel economy average for light-duty vehicles to about 50 mpg by 2026. Trump, upon urging of automakers, is trying to freeze the target starting in 2020, at 37 mpg. 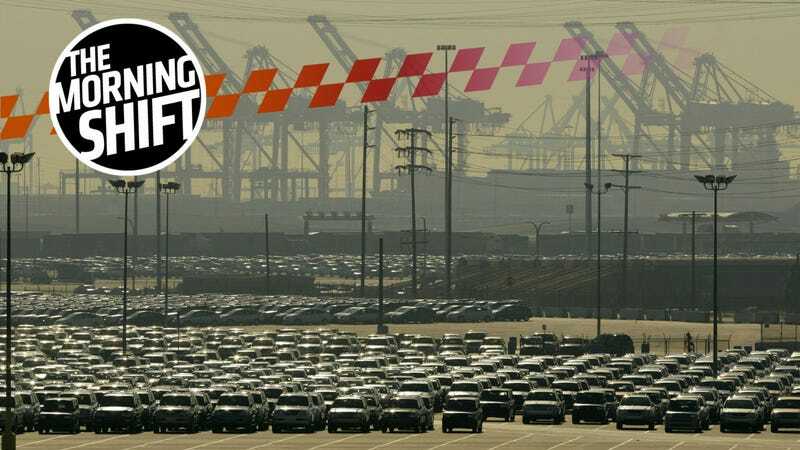 California has consistently said it would fight any sort of rewrite at this scale, but it apparently took automakers until now to realize this. And so automakers are facing a possible reality where the U.S. has two completely different set of standards. “Operating under two or three sets of regulations would be inefficient and disrupt a period of rapid innovation in the auto industry,” [David Schwietert, executive vice president of federal government relations at the Alliance] wrote, adding that fractured rules could have negative consequences for the roughly 7 million people employed directly or indirectly by the American auto industry. A common trope in the industry is that, once autonomous driving technology is ready for the primetime, truck drivers are doomed. In theory, it makes sense: semi-trucks handle long, long stretches on the highway, so if there’s any area that could be first to experience change from self-driving technology, it’s the trucking industry. I don’t find the argument too persuasive—the technology is decades away from being safe enough to completely upend the need for truck drivers—but there is a more pressing issue at hand: we don’t have enough truck drivers. A year ago, when customers would call [Joyce] Brenny, she could almost always get their goods loaded on a truck and moving within a day or two. Now she’s warning customers it could take two weeks to find an available truck and driver. Shipping costs have skyrocketed in the United States in 2018, one of the clearest signs yet of a strong economy that might be starting to overheat. Higher transportation costs are beginning to cause prices of anything that spends time on a truck to rise. Amazon, for example, just implemented a 20 percent hike for its Prime program that delivers goods to customers in two days, and General Mills, the maker of Cheerios and Betty Crocker, said prices of some of its cereals and snacks are going up because of an “unprecedented” rise in freight costs. Tyson Foods, a large meat seller, and John Deere, a farm and construction equipment, also recently announced they will increase prices, blaming higher shipping costs. Maybe it’s time to put the pre-written obits of the truck industry aside for now and focus on this side of the story a bit more. Until now, most of the chatter surrounding the deteriorating conditions of subprime auto loans has focused on the performance of the loans themselves, and how more and more drivers are being impacted by the reality they can’t afford their payments. But an interesting look from Bloomberg offers a possibility that carmakers themselves could wind up seriously hurt from offering loose credit with questionable terms for years. It’s time to reassess the carmaker halos around auto-finance bonds. True, delinquency rates for the highest-quality (prime) loans aren’t surging, but the weakening auto market could change that picture rapidly. Lenders had already started tightening standards last year. But more of the financing is now going toward used cars, prices of which are under pressure. The captive finance companies account for anywhere from 65 percent to 90 percent of their parents’ debt burden, and a big part of how their securities are rated (and where they trade) is dependent on the owner’s rating. That’s a lotta debt, uh. That dependency isn’t a guarantee, though, and the benefit of big backers goes only so far. As the finance arms pile on debt, their fat margins are being compressed and revenue growth is fading. Interest costs continue to tick up with market rates, and the firms’ issuance of bigger chunks of more expensive, unsecured debt are coming home to bite. Loan losses have been rising. OK, so it sounds like a doomsday scenario. But times are good right now. The economy is cruising. Here’s another measure of stress: In good times, car companies rely on their finance units for dividends, as well as sales support. When times are bad, they pare back. And last year, Toyota Motor Credit didn’t distribute a payout to its parent, Fitch Ratings analysts point out. Over the last few months, we’ve seen some serious, and sometimes fatal, crashes involving autonomous cars or cars with semi-autonomous systems engaged. That, almost expectedly, has made people more afraid of getting in the backseat of a robot car, according to a new study from AAA. The survey by the American Automobile Association shows faith in robot rides has been shaken by two March incidents: A pedestrian in Arizona struck and killed by an Uber self-driving car and a fatality involving a TeslaModel X operating in semi-autonomous “Autopilot” mode. The fear-factor reported by 73 percent of those polled last month was up 10 points from late 2017 and nearly erased gains from the 78 percent afraid of automated cars early last year. Interestingly, the biggest spike came from the millennials, Bloomberg says, with 64 percent now reporting they’re afraid to ride in an autonomous car, up from a previous total of 49 percent. That’s another sign the auto industry has its work cut out to make self-driving cars a reality. Tracking with our 3rd Gear is a story The Washington Post published last week that’s well-worth your time over your Tuesday morning coffee if you have not read it yet. As more people fall behind on their auto loans, there’s an interesting dynamic at play, and it involves a familiar foe: the repo man. It’s a long read that follows the tail of repo workers of today. And it’s something everyone should acknowledge: people are quick to point out that car buyers should know better when agreeing to risky loan terms, but it’s the automakers themselves that supported a system of loose lending for years, all in the quest to reach record sales, something now fading fast in the rear view mirror. This has genuinely real consequences, and this piece offers a superbly-reported example as to how those consequences can manifest. Check it out here. Did the recent fatal AV-related crashes change your mind about them at all? Or are you afraid they’ll never be safe for the road? Should automakers be doing more to make sure they’re safe for the public?